The price cuts have been made in a bid to make its existing socket AM4 Ryzen processors more competitive against 8th generation Intel Core "Coffee Lake" processors. Where is Ryzen 5 1400? Now I'm REALLY happy I didn't spring for a used 1700x for $310 yesterday! Great timing with Meltdown happening. Just what AMD should have done so many times in the past. When your foe is down you don't let them live...you kick them in the junk till they puke and faint! So glad I went for a 1700 when I got mine, as it hasn't lost nearly as much in value as some of the other parts. Great as I have yet to upgrade but man, a 10 dollar difference between the 1700 and 1700x? EOL. It will be replaced by the 2400G on February 12th. Same for Ryzen 3 1200, it will be replaced by the 2200G. The 1700 comes with a cooler while the 1700X does not. So the 1700X is actually $30-40 costlier. Of course if someone is planning on buying an aftermarket cooler there is no reason not to spend the extra $10. Now I really have to wonder, how much better will the Generation 2 be? 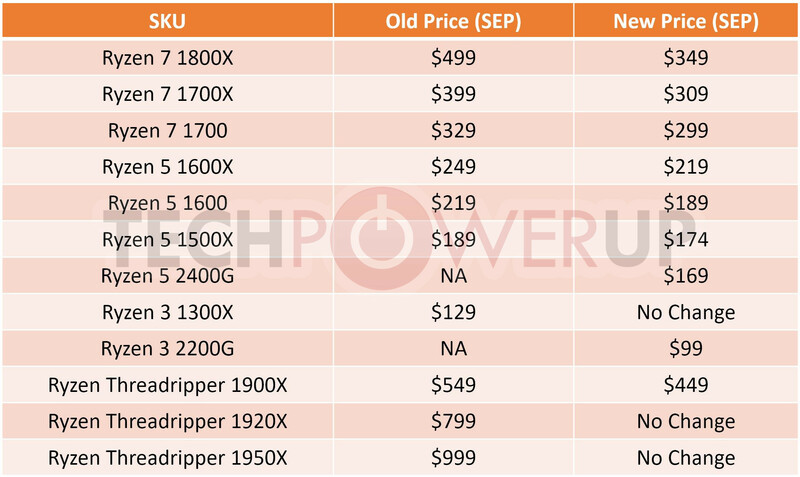 I'm planning to update my PC this year and the price drop is great news, I bet the gen 2 Ryzen will be a price/performance king too. i was actually going to be buying a ryzen 5 1600 this week so this is some good news. already got my ddr4 3200mhz ram on the way (x2 super talent F3200UA8G single sided dims) and motherboard (asrock ab350m pro4). just need the proc and im all set. Love my 1700, loving the price cuts too. Too many specters haunting Intel, so much red! I just hope this means AMD believes Zen2 will add something interesting to the table. 10%. It's a refresh. Clocks can be as high as 200Mhz more then previous generation. And any flaws, bugs or whatever are squashed down basicly. But yes, Ryzen is very competetive. It's so nice to see AMD in a position to go for the jugular like this. The 8700k can be found for $379 and $369 without much trouble (even prior to the Meltdown/Spectre news, and more so now), and 1800x is currently listed at $459 at Newegg. So comparing them apples to apples I'd say it's more fair to compare the 8700k at $369-$379 to the 1800X (well at least soon) at $349. It's tough to compare while accounting for the retailers gouging above MSRP which so many are doing with all cpus/gpus nowadays. But after these price drops I'd definitely say AMD is a viable option if choosing a new cpu for any use. I have a personal preference for my own use, but they are close enough that there isn't really a wrong answer. Well, 'x' is the roman numeral for ten.... 1700x just means 10 dollah moah! The GPU department is really doing very awesome, they have gained control over the Gaming Console market, they have a nice marriage with New Intel CPU's and they are in the high end Macs, just to name a few of their GPU successes. .....ok can we all give AMD a standing Ovation for their CPU line and it's execution. Very impressed with AMD and this is just going further to prove this..